The Trinomial Cube is an amazing Montessori material that introduces abstract maths concept to children as young as 4 without them even knowing it! The cube is composed of 8 wooden blocks which fit together in a trinomial pattern. Early Educational Toys Cultivate children\'s visual ability, cognition and understanding of three-dimensional space. To lays the foundation for the development of later math skills, really the best baby educational games. The purpose of the material is not to teach maths, but instead, to provide a challenge for a child\'s ability to find patterns & relationships.The child is not asked to understand the formula, but is using the cube in a mathematical way. The child will build up a predisposition to enjoy & understand mathematics later.It provides the child with tangible experience of the way in which the cube can be divided & sub-divided. The material is presented as a sensorial activity. It is presented like a three dimensional puzzle. Safety , Non-toxic, tasteless, against strong and unbreakable, round edge to ensure your kids safety play. 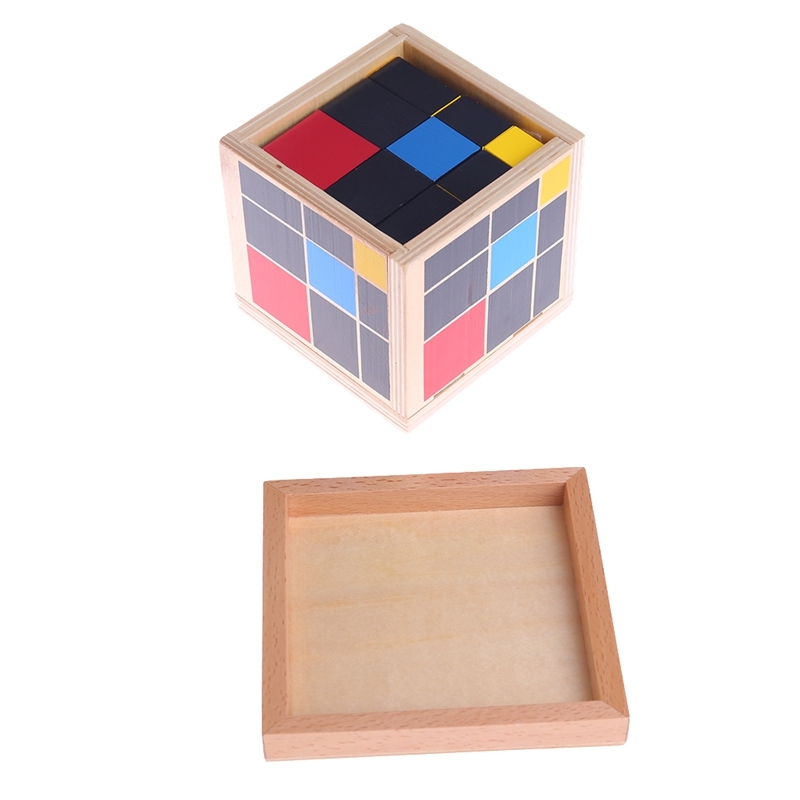 Three wooden cubes: red, blue, and yellow. Eighteen square based prisms. 3 red and black, the same height as the blue cube. 3 red and black, the same height as the yellow cube. 3 yellow and black, the same height as the red cube. 3 yellow and black, the same height as the blue cube. 3 blue and black, the same height as the yellow cube. 3 blue and black, the same height as the red prism. Six black rectangular based prisms, whose 3 dimensions correspond to the edge of the red, blue, and yellow cubes. The square of the trinomial is painted on the lid. Indirect Educational Goal : 1, cultivate children\'s keen observation and concentration. 2, Cultivate children\'s logical thinking ability. 3, Hand - eye coordination action. 4, It lays the foundation for the development of later math skills. Our recommend age : 3 to 3 1/2 years old.